Begin by speaking to King Arthur in Camelot Castle. First off, go to Camelot Castle and talk with King Arthur, found on the first floor. Ask him if you can join the Knights of the Round Table, and he will tell you about Merlin who is trapped inside a crystal. He suggests that you speak with each of the other knights around Camelot for advice. You can talk to all of them, but only 1 will have something useful to tell you. Find Sir Gawain and ask him how Merlin was trapped. From there, head upstairs into the northeast room and talk with Lancelot, who seems to be completely full of himself. Ask him about how to get into the Morgan Le Faye Keep, and he will eventually tell you that you need a boat to get inside. Head to Catherby and converse with Arhein who runs the General Store on the pier. Ask him about where he sails to, and then ask if you can get a lift. He will tell you that he can't at the moment, as he is waiting for a box of candles. Head to the back of the Candle Shop to the north and hide in a box behind it. Continue waiting inside until you are taken to the boat, and you'll soon end up on the dock of Keep Le Faye. Walk through the doors and go up the 2 sets of stairs, ignoring the Renegade Knights (unless you wish to kill them). Attack the level 34 Sir Mordred, and just as you're on the verge of killing him, Morgan Le Faye will appear and ask you to spare her son. Warning: If you go outside the castle at this point, you won't be able to enter again. You will need to head back to Catherby, hide in the candle box and get to the Keep like you did at the start of the quest. Ask her about getting Merlin out of the crystal, and she says that you need Excalibur, a Black Candle, Bat Bones, and some magic words. Ask her about the sword and the words; apparently the Lady of the Lake has the sword, and the words are inscribed on a Chaos Altar. Go down the stairs, out the doors and kill a Bat or two, in case you accidentally bury the bones. These bats are level 64 and may be hard for low leveled players. If you have trouble killing a bat look for a nearby player to kill one for you so you can get the bones. Take the Bat Bones and head north to Catherby, since you can't get back by boat. You'll need a Bucket and some Insect Repellant to get the candle. 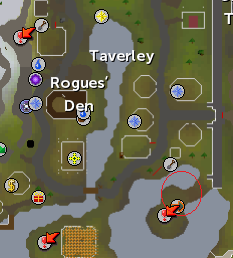 There is a Bucket respawn near the Beehives west of Catherby, and the Insect Repellant can be found in the building north of the bank. Pick each of the items up, head to the Beehives and use the Insect Repellant on them. Now choose the "Take From Beehive" option to get a bucket of Wax. 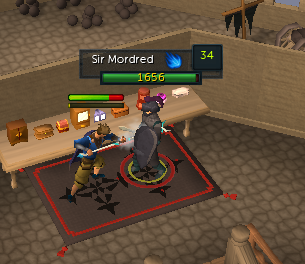 Take this to the Candle Maker in Catherby, have him make a Black Candle and then light it with a Tinderbox. Now get a loaf of Bread and head to the lake just southeast of Taverley. Walk to the farthest point and speak to the Lady of the Lake. She'll tell you to go to the Port Sarim Jewelry Shop. When you try to open the door, a Beggar will appear and ask for food. Give him your Bread and the Beggar will become the Lady of the Lake, who will now give you the Excalibur Sword. For the magic words, you'll need to find a Chaos altar. 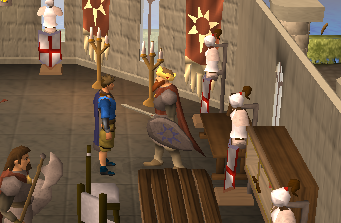 Head to the temple in the southeast part of Varrock and choose the "Check it" option. You'll find that the magic words are: Snarthon Candtrick Termanto. Go back to Camelot Castle with all of the items and you should find a fountain in the northeast part of the castle garden. To the east is a small building, and inside should be a circle-like decoration on the floor. Stand in the middle of it and drop the Bat Bones. A level 100 Spirit named Thrantax the Mighty will appear and if you say the words correctly, he'll obey you (if not, he'll attack you instead). Your character will wish that Merlin could be freed from the crystal and it will grant your wish. Now head back into the castle, up the ladder to the southeast and up the next to find Merlin trapped in his crystal. 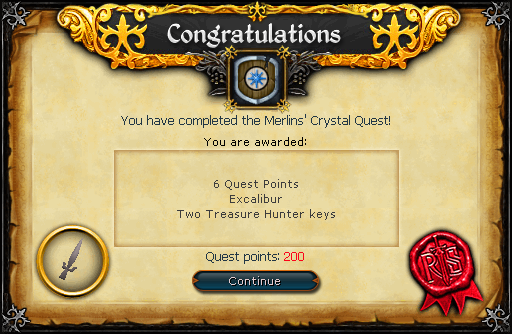 Use Excalibur on the Crystal to free him, and then speak to Merlin. He says to collect your reward from King Arthur. Go down the ladders and talk to him, and your quest is complete! 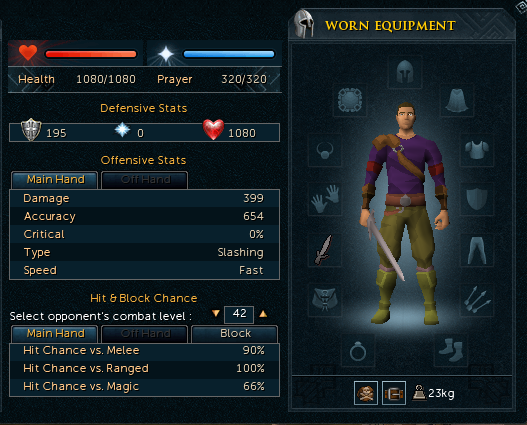 The Excalibur sword is not very powerful, but it is one of the few weapons in RuneScape that has a special attack. It's worth noting that when you use the special attack, it increases your Defence temporarily.